Visit Sunny's website if you would like to purchase his paintings. His education included attendance at the University of California at Berkley and The Art Center College of Design in Pasadena, California. He then, at age twenty-two, began to work for the motion picture industry. He created over six hundred background pictures for the animated feature, Fire and Ice. 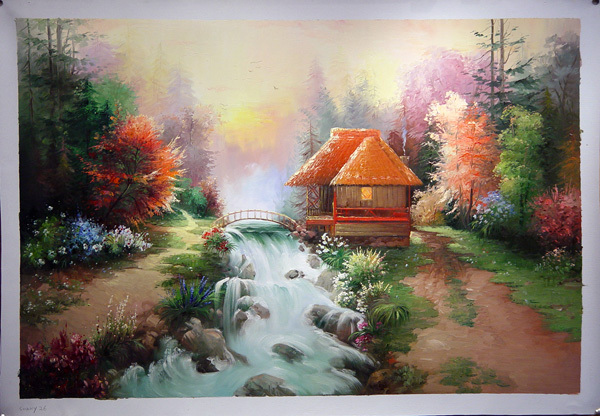 He left the motion picture industry in 1983 in pursuit of Luminist landscape painting ventures. Thomas Kinkade also pursued other artistic ventures, such as co-authoring a book while traveling across the country in a boxcar with a past college roommate (This same roommate is said to have worked on the motion picture, Fire and Ice�s background paintings with Kinkade). Critics claim the preparatory sketches used during the creation of this book launched much of the inspiration backing his early career. This left-handed artist has been internationally published for well over a decade with no evidence of slowing down in sight. It all started when he married his sweet heart, Nanette, in 1982. It was after that they began to seriously publish his work together. He is a devout Christian and dedicated father of four daughters: Merrit, Chandler, Winsor and Everett Christian born in 1997. He credits the Lord for his ability and for giving him inspiration to continue producing such high quality creations. His Christianity shines through in each piece with a magnificent glow. The demand for his work grows with each passing day. His rigorous six-day work schedule enables him to keep up with those who both collect and admire his capabilities. His work can be found in such reproductions as signed lithographs, inspirational books, calendars, cards, figurines, collectibles, canvas prints, posters, magazine covers, collector plates, computer software, Bible book covers and much more. more often than not, his work seems to become more easily found and available during the holidays due to its high appeal for gift giving. Because his subject matter derives from his own personal experiences and family memories, they are exceedingly popular among those in search of that type of nostalgia. His work can be found displayed prominently in both secular and religious retail environments. Today, Thomas Kinkade can be found devoting time to his craft, devoting time to his family, devoting time to religious activities, creating donations for charitable causes and speaking publicly at various events. When he has free time, Thomas Kinkade enjoys dedicating it to personal worship, reading and to traveling extensively with his wife and children he recently published a book illustrated with his work about his philosophies surrounding faith and the importance of family.